Dragon’s tail, first initiated in October 2010, is a MMORPG (Massive Multi-Player Online Role Playing Game) that players have the option of a multitude of different style of games to play, each with a different objective and game structure. As a unique option to wager Bitcoin with, Dragon’s Tale provides players a more “computer game” feel when wagering Bitcoin on the selections they provide. Although this is a rare form of gambling that new players might have a difficult time of grasping, at first, it is safe to say that once a new player gets the knowledge of how Dragon’s Tale operates, it will be a favorite for player’s seeking a role playing game feel, rather than a run-of-the-mill casino style approach. As previously noted, Dragon’s Tale is quite a bit different than any other Bitcoin gaming platform out there, just for the uniqueness of its style alone. Players will not find games such as Blackjack, Roulette, or any other casino style of game within Dragon’s Tale, but will instead find games that are both skilled and a block throughout the Dragon Tale world. Dragon’s Tale offers players games that have both a multiplayer objective to them but also have solo games, such as Cow-Tipping, that are based like many games players are used to taking part in. What makes these games so unique is that there are over fifty games that players have the choice of playing, each with its own objective to winning and with a lot of them consisting of potential payouts that exceed a 1:1 reward. Players will find that playing at Dragon Tale is very non-repetitive as the selection is tremendous and the games are all unique by how they are played. 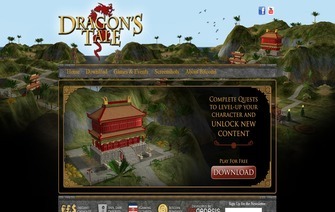 Players will find that Dragon’s Tale offers quite the selection of player versus player games and that alone makes Dragon Tale a desired place to play. The only setback to what Dragon Tale gives its players is the unfamiliarity of MMORPG that some players may experience when they first start to adapt to this new style of Bitcoin gaming. One of the most compelling parts of Dragon Tale is the idea that they offer games that give away Bitcoin, with no strings attached, even for new players who have not yet deposited, just to get the hang of a concept that they probably will not be too comfortable with, when first starting out. As time goes on, and more players begin to grasp the concept that is Dragon’s Tale, it most assuredly will be a place that players like to play at, when the redundancy of playing hand after hand of Blackjack and spin after spin of Roulette gets too mundane. Support at Dragon’s Tale is quite exceptional for how much traffic it receives. The code is unique and the owner has basically built the game from scratch, the time it takes to receive a response to a request of support, is quite impressive. Support usually takes no longer than eight to ten hours for a response, which is tremendous due to the fact that it is basically a one man operation. Banking at Dragon’s Tale is also exceptional due in large part to being able to deposit via both in cryptocurrency and via major credit cards, for players residing outside the US. Deposits are instant and withdrawals take one confirmation of the deposit, before any funds are able to be withdrawn, which is a Bitcoin gaming standard. Dragon’s Tale uses its own variation of the “Provably Fair” verification and can be checked against records to confirm the validity of both wins and losses. Dragon’s Tale can best be summed up by saying it is very unique, to what an average player may be used to when they are wagering with Bitcoin, in a normal casino set-up. Although there may be a learning curve to this platform, Dragon’s Tale is definitely enriched with a different style of game play that players will certainly be entertained with, once they are able to grasp the concept. Being online for nearly five years is a great example of how the concept, although confusing at first, ends up being both fun and able to provide a safe place for players to wager Bitcoin, in a slightly more unconventional manner. Bonus Receive free bitcoin gifts from soldier statues. The more you play the more chances you have!